I am very much looking forward to sharing the stage of the Concert Hall of the Fryderyk Chopin University of Music in Warsaw, Poland, with my distinguished friends. I worked here for many years, I performed on this stage many times, and it never crossed my mind that someday, I will be here with all of you! For more information click here or on the poster below. I was happy to receive this article from John Bell, my former student, long time friend, my first ski instructor and music lover who, being himself a great specialist in quite remote profession, is still maintaining to practice and play piano often. It makes me so happy to see you loving music so much, John! For so long time we were wondering what was the true cause of F. Chopin's death. Science and technology, knowledge and pioneering techniques are taking us closer and closer to a moment, when going back in time, recreating processes and reading history from remains will become even more reliable. On April 20th, 21st, 22nd 24th and 25th, 2018 I will be performing F. Chopin's music for "The Lady of the Camellias" ballet spectacle by John Neumeier at the National Opera in Warsaw, Poland. I am very much looking forward to be part of this beautiful production of the Polish National Ballet. This isn't the first time I have an opportunity to collaborate with the Polish National Ballet. The very first time it was "Fortepianissimo" choreographed by Lorca Massine. The second spectacle "Chopin The Romantic Artist" choreographed by Patrice Bart was the production taken abroad. At the invitation of Valery Gergiev, the Polish National Ballet presented this production twice at the Mariinsky Theatre in St. Petersburg as part of the Stars of the White Nights Music Festival. We also performed this spectacle at the SHOAC Centre in Shanghai, China. In 2010 I was honoured to perform Chopin's music at the Wiener Opernball. This was another touching moment for me to collaborate with the Polish National Ballet and Wiener Staatsballett dancers during the presentation choreographed by Giorgio Madia. Watch it here. In 2003 I was also collaborating with Alberta Ballet playing music by Tchaikovsky for their spectacles in Calgary and in Edmonton. "The Lady of the Camellias" will be presented later on during current and 2018/2019 season with four more spectacles coming already in June, 2018 (21, 22, 23, 24). Watch this teaser beautifully performed by Yuka Ebihara & Patryk Walczak. I couldn't be more happy for my student Daniel Szefer, who became a Winner of the Calgary Philharmonic Orchestra 2018 Concerto Competition after performing F. Chopin's Piano Concerto in F Minor Op. 21 yesterday evening (March 13, 2018) with the Calgary Philharmonic Orchestra under the direction of Professor Edmond Agopian at the Eckhardt-Gramatté Hall at the University of Calgary. Congratulations Daniel! You have made me proud of you yesterday! I wish you all the best and more successes like this! Thank you, everyone, who helped Daniel, who helped us, who helped me! I congratulate Sua Kwoun, Cameron Wong, and Daniel Dastoor! You were all magnificent! From left to right: Karl Hirzer (Resident Conductor of the CPO and Jury), Paul Dornian (President & CEO of the CPO and Jury), Brad Mahon (Director, MRU Conservatory), Daniel Dastoor (violin), Sua Kwoun (cello), Cameron Wong (oboe), Daniel Szefer (piano), Edmond Agopian (Professor, Conductor and Violinist), Bruce Barton (SCPA Professor & Director), Joelle Welling (SCPA Chair & Senior Instructor). NOSPR will perform under the baton of Łukasz Borowicz. 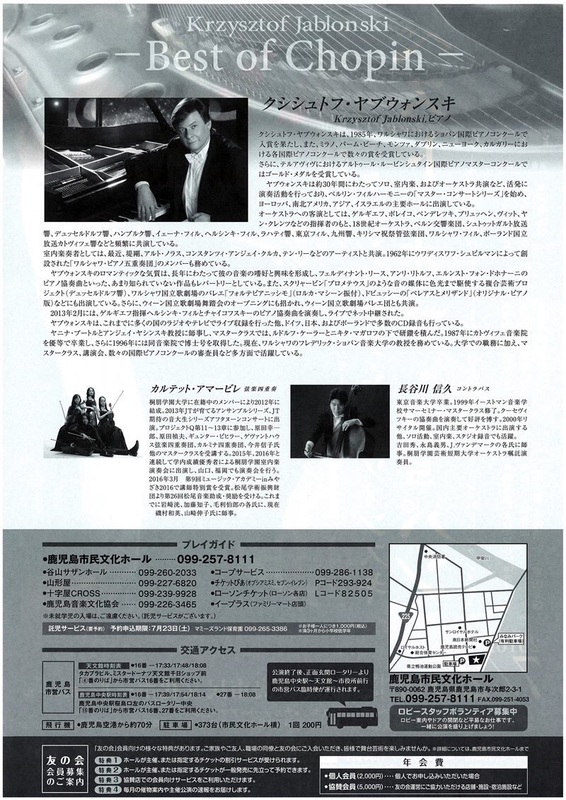 I will have a pleasure to join them for Piano Concerto No. 5 by Beethoven. Symphony No. 3 in A Minor Op. 44 by S. Rachmaninoff will follow. 7:30 PM local time in Poland. Krzysztof Nieborak, my close friend from school and wonderful guitarist himself, has surprised me today by posting this video on my Facebook. Krzysztof! Thank you! I didn't even remember I recorded this TV recital. We all like when someone says something good about what we do, don't we? I just felt like that when this article was sent to me and translated... Thank you Masako Hirota-San! Arigato gozaimas! Fryderyk Chopin, Etudes Op. 10 and 25. Years of work and struggles, doubts, new ideas, improvements, and more... I feel deep satisfaction that I was able to "deliver" them once more, based on all the things I have learned and developed over years. My thoughts are going to all those who influenced my growth over years, starting with my beloved Teacher - Janina Butor. It would not be possible without her. All the technical skills needed for attempting to comfortably play Chopin's Etudes I have learned under her direction. Further developed and improved under Prof. Andrzej Jasiński's guidance and finally, during many years of my own artistic work and teaching. Thank you very much Dir. Stanislaw Leszczynski for convincing me to record them once more and for creating such an opportunity. Without your persistence and getting back to me so many times over last couple of years with the same question, this project would never happen again. Thank you Gabriela Blicharz and Lech Dudzik for inspiring me and giving me strength as well as your constructive comments and suggestions during recording sessions! I always loved working with you and I love it even more now! Thank you Mrs. Agnieszka Smektala for your care and all the work you did in order to coordinate things and making it work! Thank you very much to all of you involved more or less in this work! I am pleased to share this announcement! Tickets are now available. No Chopin this time. Debussy's Children Corner, Ravel's Jeux d'eau and Gaspard de la Nuit for the first half of the program, Mussorgsky/Horowitz/Jablonski - Pictures at an Exhibition for the 2nd half. On July 25th, 2016 I had a rare occasion and a great pleasure to perform Chopin's Concerto No. 1 in E minor Op. 11 with Quartet Amabile and Nobuhisa Hasegawa at the Kagoshima Citizens' Culture Hall (Second Hall) in addition to my solo portion of the evening. It was a treat to have you all on stage! You played wonderfully! Big Bravo and thank you very much! 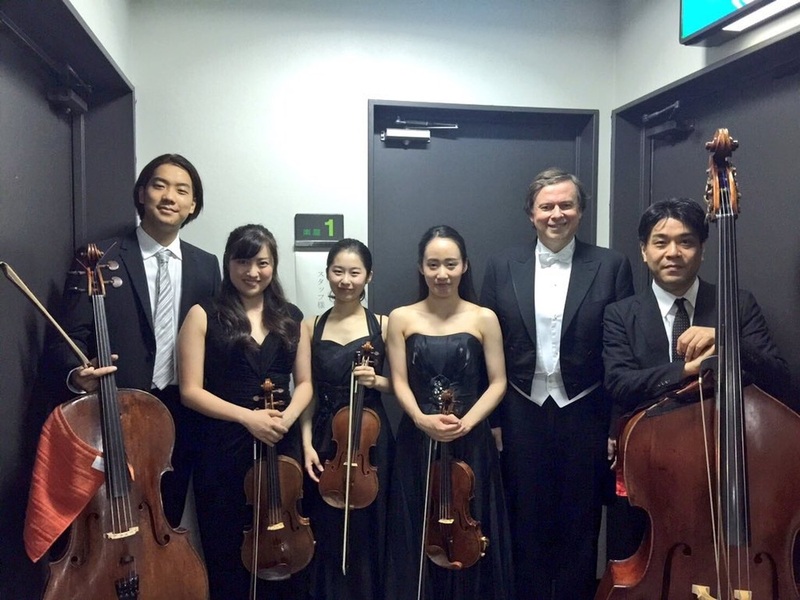 The concert was part of The 37th Kirishima International Music Festival 2016/Kagoshima. We had full house and I was very happy about it! Thank you JESC Music Foundation for such a brilliant idea!